The Foresters were created by founding member Llwyd Forester in AS 46 and actively began recruiting members in AS 48. Initially the Guild operated under a letter temporary; a document which outlined their future plans and mandate. With six members by the end of their first full season they began to actively engage in period outdoor activities and outdoor cooking at events. 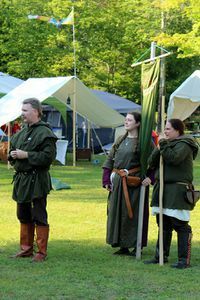 As historical foresters were most often lower class or at best extremely low ranking nobility that were illegitimate, the guild emulated a style of dress and culture very different from the majority of the SCA. The wearing of Forest or Lincoln green in the summer and grey in the winter. This was done for two reasons; first because it is based on historical fact, and second because the type of people typically most attracted to medieval outdoor activities in the forest prefer a simpler working class style of dress that functions well in the outdoors in all weather. The majority of the members were drawn from those in the SCA whom enjoyed the outdoors. It also began to draw back older members whom had left the SCA in the past because they had never actually found an activity that was right for them. 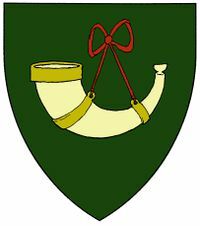 By AS 49 the foresters had established themselves in the shire of Lyndhaven, The Shire of Avonmore, and the Cantons of the Barony of Ruantallan. The Foresters paroled the forests and brought offenders before the Baron and Baroness for judgment and were involved in pitched battles with a feared outlaw known as Asgirr the Giant whom was subsequently arrested and brought to face justice. By the end of AS 49 the Foresters were a small force for good in the eastern part of Tir Mara and were known for tending camp fires, assisting people with tents and camp chores and had a membership that had doubled in size from the previous year. 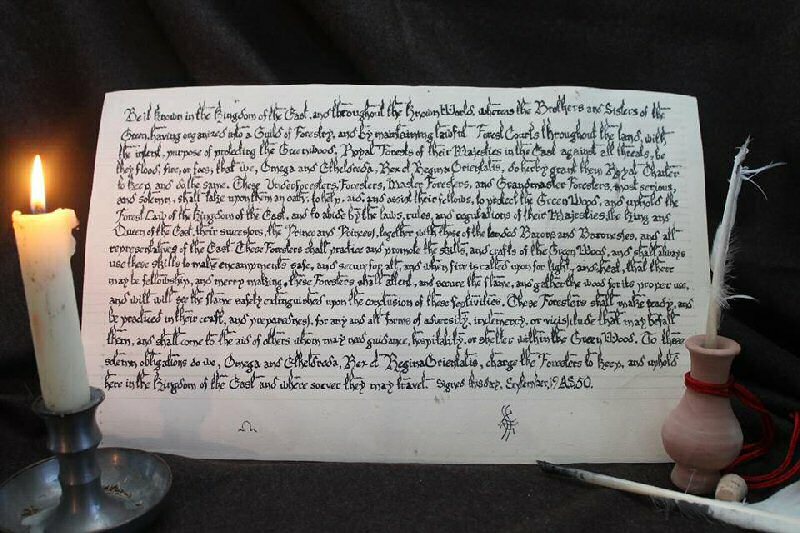 With the interest in the Foresters guild growing it was at this point a petition for a royal charter was drafted to present before the king and queen. The harsh winter of AS 50 presented some adversity for the Foresters and there was still snow on the ground at the first encampments of the season. Their letter of petition reached the king and queen and so the guild prepared for court later that year after gaining a favorable response. In September of AS 50 King and Queen of the East Omega V and Etheldreda IV granted the Foresters their Royal Charter. The newly created Royal Foresters quickly attracted interest from other parts of the kingdom, and a great number of new foresters from the Barony of Endewearde were granted a letter temporary to organize themselves into a regional court under the Royal Charter. By October of AS 51 Endewearde had completed all the tasks assigned to it by the guild and became the first official region al guild under the Foresters Royal Charter. The Endewearde group known as "The Court of the Royal Forest of Endewearde" reports their activities at the Baronial level and to the greater guild. AS 51 saw the guilds begin to accept affiliated members from other kingdoms with the intent of assisting them to form their own Kingdom Foresters Guilds. The kingdoms of The East, Atlantia, North Shield and Lochac, all have members of the foresters guild who share various customs and traditions and are loosely affiliated as the Known World Foresters Guild. At the Woodmoot in May of AS 51 the Second Warden of the East was elected to office. Seamus na Coille Aosda officially became the Warden of the East at the Endewearde Hunt in October of AS 51. The previous Warden of the East having served his term took his place among his brothers and sisters once again but as a Grandmaster, or an advisor. Whereas the Brothers and Sisters of the Green, having organized into a Guild of Forestry, and by maintaining lawful Forest Courts throughout the land, with the intent, and purpose of protecting the Greenwood, and Royal Forests of their Majesties in the East against all threats, be they flood, fire, or foes; That we, king and queen of the East Kingdom, Omega and Etheldreda Rex et Regina Orientalis, do hereby grant them Royal Charter to keep and do the same. These Underforesters, Foresters, Master Foresters, and Grandmaster Foresters, most serious, and solemn, shall take upon them an oath; to help, aid, and assist their fellows, to protect the Greenwood, and uphold the Forest Law of the Kingdom of the East, and to abide by the laws, rules, and regulations of their Majesties, the King and Queen of the East, and their successors, their Highnesses the Prince and Princess of the East, together with those of the landed Barons and Baronesses, and all lawful representatives of the Kingdom of the East. These Foresters shall practice, and promote the skills, and crafts of the Greenwood, and shall make themselves proficient, and in time masters of the woodland arts and sciences, and they shall always use these skills to make encampments safe, and secure for all, and when fire is called upon for light, and heat, that there may be fellowship, and merry making, these Foresters shall attend, and secure the flame, and shall gather the wood for its proper use, and will see the flame safely extinguished upon the conclusion of these festivities. These Foresters shall make ready, and be practiced in their craft, and preparedness, for any and all forms of adversity, inclemency, or vicissitude that may befall them, and shall come to the aid of others whom may need guidance, hospitality, or shelter within the Greenwood. To these solemn obligations do we Omega and Etheldreda Rex et Regina Orientalis Charge the Foresters to keep, and uphold here in the Kingdom of the East and wheresoever they may travel. 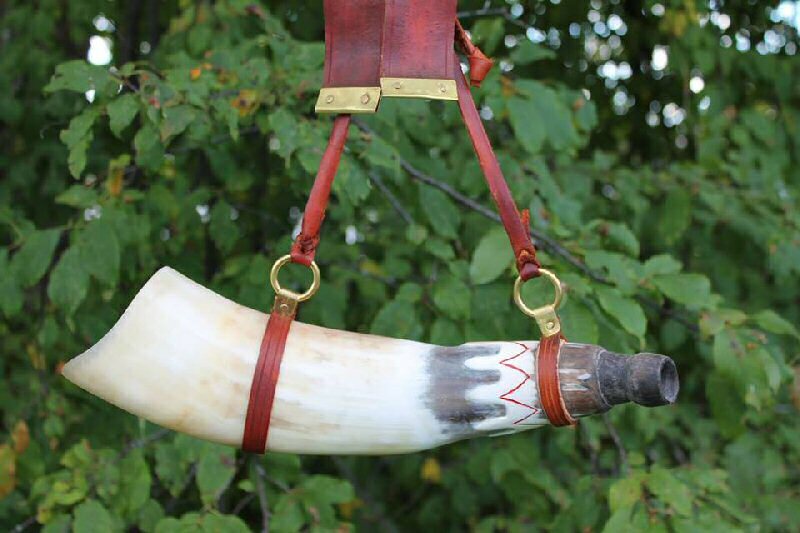 In medieval days the symbol of the Forester and the badge of his office was the Hunting Horn. The medieval equivalent of the mobile phone it allowed men in the forest to stay in constant communication with one another even if they were not in a direct line of site. The Warden of the East Kingdom Foresters will sound the horn to call members to meetings or to summon them for another purpose. The East Kingdom Foresters Guild is first and foremost a camping and outdoor living group. 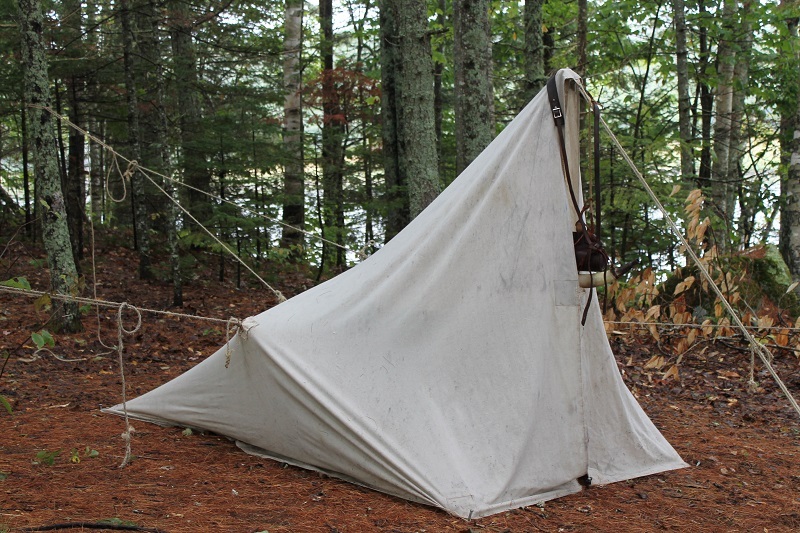 We study and teach primitive and medieval outdoor and survival skills. We also engage in travel overland or inland waterways both with medieval equipment and with modern. The mundane hikes and canoe trips are organized by the members and include all ages. The medieval reenactment activities happen at SCA events or are guild organized. The Guild is administered by a Principal Officer. This officer is called the Warden which is an ancient title for a Forest Law administrator in Medieval England. The Warden is addressed as "Honorable Warden" in guild meetings or Forest Courts and assumes the title of Warden of the Forest or Warden of the East for written communications but does not use these titles during day to day guild business or in general at SCA events and only uses them for special occasions. The Regional Chapters are administered by a deputy principal officer for that area, and are known as a Keeper or Keeper of the Forest and they are based on their historical counterparts in Medieval England. They are addressed as "Honorable Keeper" at meetings and Forest Courts and may in writing be addressed in full as Keeper of Endewearde Forest (or the forest of their chapter) but like the Warden will not use these titles outside the guild except on rare and special occasions. The Foresters structure is broken up into ranks which are acknowledgment of skill and dedication to the group and are not hierarchical. All members are brothers and sisters and are equal regardless of skill. Dedication is more highly prized. Junior Foresters include anyone under the age of 18. They do not need to apply for membership and are accepted by the Warden at events. Forester Friends include camp followers who have not applied for membership. Novice members include applicants whom are new or are just beginning to learn. Sworn Members include members whom are fully initiated and whom have taken an oath to the guild and crown to protect the greenwood and to educate others. Forester is the journeyman rank which is easy for experienced outdoorsman and can prove tricky for beginners to achieve. Highmaster Forester is not a rank but an acknowledgment of service for those whom have served as the guilds deputy Warden or Deputy Principal Officer either as Warden of the North or South. Grandmaster Forester is not a rank but an acknowledgment of service for those whom have served as the guilds Warden or Principal Officer. Woodward A member of the Order of St. John Gaulbert who has completed an arts and Sciences or Service challenge or a member whom has attained the rank of Master has served as Keeper and Deputy Principal officer for five years or more. Regarder A member of the Order of St. Eustace who has completed a martial challenge in archery, thrown weapons, fencing or heavy combat. Ranger A member of the Order of St. Hubert who has completed an outdoor survival challenge in the wilderness. Warden of the North An assistant to the principal officer whom acts in his stead in the Principality of Tir Mara. Warden of the South An assistant to the principal officer whom acts in his stead in the American states that make up the East Kingdom. Warden of the East The Principal Officer of the guild for all of the East Kingdom. This page was last edited on 20 February 2018, at 13:45.